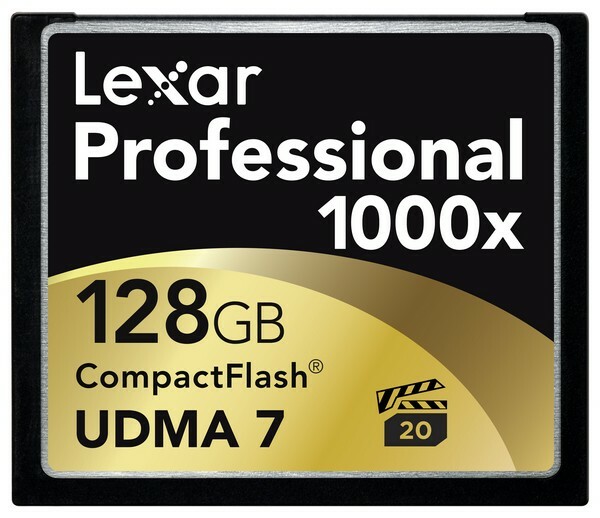 Fremont, CA, 5 January, 2012 – Lexar, a leading global brand of flash memory products, today announced the industry’s first 1000x memory card, the Lexar® Professional 1000x CompactFlash® (CF) card. The new card provides professional photographers and advanced photo and video enthusiasts with blazing-fast 150MB per second minimum guaranteed sustained read speed. * The Lexar Professional 1000x CF card will be available in 16GB, 32GB, 64GB, and 128GB capacities, and supports the VPG-20 specification, meaning the card has been tested and guaranteed for professional video capture streams at up to 20MB per second, ensuring professional-quality video at high frame rates with no dropped frames. 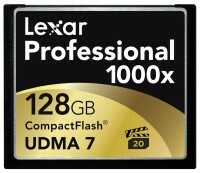 In addition, the Lexar Professional 1000x CF memory card helps accelerate the digital photography workflow, helping clear the camera’s buffer for uninterrupted shooting and quickly transferring images and video from the memory card to the computer, when paired with a UDMA 7-enabled reader such as the Lexar Professional USB 3.0 Dual Slot Reader. For additional information about the Lexar Professional 1000x CF card, visit www.lexar.com. The Lexar Professional 1000x CF card provides consumers with the quality and reliability they have come to expect from Lexar. All product designs are tested in the Lexar Quality Labs to ensure performance, quality, compatibility, and reliability with more than 800 intended digital devices. All Lexar Professional cards include a limited lifetime warranty and free, dedicated professional technical support. The new Lexar Professional 1000x CF card will be available in February, with MSRPs of £149.99 (16GB), £269.99 (32GB), £469.99 (64GB), and £799.99 (128GB).